Rabies (and rabies virus, its causative agent) is usually transmitted through the bite of an infected animal into muscle tissue of the new host. 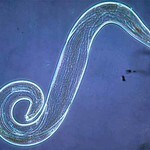 From there, the virus travels all the way to the brain, where it multiplies and causes the usually fatal disease. An article published online on August 28, 2014 in the open-access journal PLOS Pathogens sheds light on how the virus hijacks the transport system in nerve cells to reach the brain with maximal speed and efficiency. Pathogens that travel in the blood can spread throughout the body without much effort, courtesy of the heart's pumping action. Those traveling outside the blood stream and needing to cover large distances—like rabies virus which depends on the nerve cell network—need to utilize other means of transport. Nerve cells (or neurons) in the periphery, i.e., at the outskirts of the body, as opposed to the central nervous system or CNS), are highly asymmetric: they have a cell body from which a long protrusion called an axon extends to another nerve cell or a target organ like muscle, along a specific transmission route. Axons can measure several hundred times the diameter of the cell body, and, in addition to rapid transmission of electric impulses, they also transport molecular materials over these distances. Rabies virus is known to somehow use this transport system, and Dr. Eran Perlson, from Tel Aviv University, Israel, and colleagues set out to examine the details of how this occurs. The researchers set up a system to grow asymmetric nerve cells in an observation chamber and use live cell imaging to track how rabies virus particles are transported along the axons. The team focused on the p75NTR receptor, a protein which is found on the tips of peripheral neurons and is known to bind a small molecule called NGF (for nerve growth factor). Researchers at the University of California at Davis (UC Davis) have made some surprising discoveries about the body's initial responses to HIV infection. Studying simian immunodeficiency virus (SIV), the team found that specialized cells in the intestine called Paneth cells are early responders to viral invasion and are the source of gut inflammation by producing a cytokine called interleukin-1 beta (IL-1 beta). Though aimed at the presence of virus, IL-1 beta causes breakdown of the gut epithelium that normally provides a barrier to protect the body against pathogens. Importantly, this occurs prior to the widespread viral infection and immune cell killing. But in an interesting twist, a beneficial bacterium, Lactobacillus plantarum, helps mitigate the virus-induced inflammatory response and protects the gut epithelial barrier. This study was published online on August 28, 2014 in an open-access article in the journal PLoS Pathogens. One of the biggest obstacles to complete viral eradication and immune recovery is the stable HIV reservoir in the gut. There is very little information about the early viral invasion and the establishment of the gut reservoir. "We want to understand what enables the virus to invade the gut, cause inflammation, and kill the immune cells," said Dr. Satya Dandekar, lead author of the study and chair of the Department of Medical Microbiology and Immunology at UC Davis. "Our study has identified Paneth cells as initial virus sensors in the gut that may induce early gut inflammation, cause tissue damage and help spread the viral infection. Our findings provide potential targets and new biomarkers for intervening or blocking early spread of viral infection," she said. Scientists at the Barshop Institute for Longevity and Aging Studies, part of the School of Medicine at the University of Texas (UT) Health Science Center at San Antonio, have found another secret of longevity in the tissues of the longest-lived rodent, the naked mole rat. They reported that a factor in the cells of naked mole rats protects and alters the activity of the proteasome, a garbage disposer for damaged and obsolete proteins. The factor also protects proteasome function in human, mouse, and yeast cells when challenged with various proteasome poisons, studies showed. These proteasomes usually rapidly stop functioning when poisoned, leading to the accumulation of damaged proteins that further impair cell function, contributing to the vicious cycle that leads to cell death. "I think this factor is part of an overall process or mechanism by which naked mole rats maintain their protein quality," the study’s first author Karl Rodriguez, Ph.D., said. This finding was reported online on July 10, 2014 in the journal Biochimica et Biophysica Acta (BBA): Molecular Basis of Disease. Generally, as an organism ages, not only are there more damaged proteins in need of disposal, but the proteasome itself becomes damaged and less efficient in clearing out the damaged proteins. As a result, protein quality declines and this contributes to the functional declines seen during aging. Enhancement of protein quality, meanwhile, leads to longer life in yeast, worms, fruit flies, and naked mole rats, Dr. Rodriguez said. Dr. Rodriguez, a San Antonio native who completed both his master's and doctoral degrees at the Health Science Center, is a postdoctoral fellow in the laboratory of Rochelle Buffenstein, Ph.D., professor of physiology at the Barshop Institute. 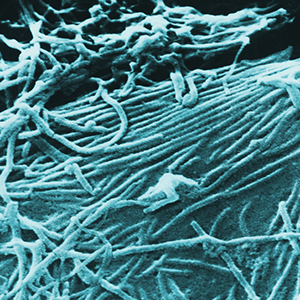 The Ebola virus, in the midst of its biggest outbreak on record, is a master at evading the body’s immune system. But researchers at the Washington University School of Medicine in St. Louis and elsewhere have learned one way the virus dodges the body’s antiviral defenses, providing important insight that could lead to new therapies. The virus has infected approximately 1,800 people since March 2014 in four West African nations and killed more than half of them, according to the World Health Organization. The researchers developed a detailed map of how an Ebola protein, VP24, binds to a host protein that takes signaling molecules in and out of the cell nucleus. Their map revealed that the viral protein takes away the host protein’s ability to carry an important immune signal into the nucleus. This signal helps activate the immune system’s antiviral defenses, and blocking it is believed to contribute significantly to the virus’s deadliness. “We’ve known for a long time that infection with Ebola obstructs an important arm in our immune system that is activated by molecules called interferons,” said senior author Gaya Amarasinghe, Ph.D., assistant professor of pathology and immunology at the Washington University School of Medicine. “Now that our map of the combined structure of these two proteins has revealed one critical way Ebola does this, the information it provides will guide the development of new treatments.” The results appeared online on August 13, 2014 in Cell Host & Microbe. A National Institutes of Health (NIH) grant of up to $15 million, awarded March 1, 2014, is helping Dr. Amarasinghe and other researchers look for drugs to block VP24 and another Ebola protein, VP35. Until recently, little has been known about what genetic changes transform wild animals into domesticated ones. An international team of scientists, one of whom is a University of Montana (UM) assistant professor, has made a breakthrough by showing that genes controlling the development of the brain and the nervous system were particularly important for rabbit domestication. The study was published in the August 29, 2014 issue of Science and gives answers to many genetic questions. The domestication of animals and plants, a prerequisite for the development of agriculture, is one of the most important technological revolutions during human history. Domestication of animals started as early as 9,000 to 15,000 years ago and initially involved dogs, cattle, sheep, goats, and pigs. The rabbit was domesticated much later, about 1,400 years ago, at monasteries in southern France. It has been claimed that rabbits were domesticated because the Catholic Church had declared that young rabbits were not considered meat, but fish, and could therefore be eaten during Lent. When domestication occurred, the wild ancestor, the European rabbit, was confined to the Iberian Peninsula and southern France. “The domestication of rabbits depended upon small genetic changes in many genes rather than more radical mutations in a few genes,” explained Dr. Jeffrey Good, UM assistant professor and a co-author on the study. “This pattern contrasts with the large-effect genetic changes that are typically associated with striking differences in the size or appearance of diverse domestic dog breeds, for example. AScientists have identified the developmental on-off switch for Streptomyces, a group of soil microbes that produce more than two-thirds of the world's naturally derived antibiotic medicines. Their hope now would be to see whether it is possible to manipulate this switch to make nature's antibiotic factory more efficient. The study, appearing in an open-access article in the August 28, 2014 issue of Cell, found that a unique interaction between a small molecule called cyclic-di-GMP and a larger protein called BldD ultimately controls whether a bacterium spends its time in a vegetative state or gets busy making antibiotics. Researchers found that the small molecule assembles into a sort of molecular glue, connecting two copies of BldD as a cohesive unit that can regulate development in the Gram-positive bacteria Streptomyces. "For decades, scientists have been wondering what flips the developmental switch in Streptomyces to turn off normal growth and to begin the unusual process of multicellular differentiation in which it generates antibiotics," said Maria A. Schumacher, Ph.D., an associate professor of biochemistry at the Duke University School of Medicine. "Now we not only know that cyclic-di-GMP is responsible, but we also know exactly how it interacts with the protein BldD to activate its function." Streptomyces has a complex life cycle with two distinct phases: the dividing, vegetative phase and a distinct phase in which the bacteria form a network of thread-like filaments to chew up organic debris and churn out antibiotics and other metabolites. At the end of this second phase, the bacteria form filamentous branches that extend into the air to create spiraling towers of spores. In 1998, researchers discovered a gene that kept cultured Streptomyces bacteria from creating these spiraling towers of fuzz on their surface. A fortuitous collaboration at Rice University has led to the total synthesis of a recently discovered natural antibiotic. The laboratory recreation of a fungus-derived antibiotic, viridicatumtoxin B, may someday help bolster the fight against bacteria that evolve resistance to treatments in hospitals and clinics around the world. As part of the process, Rice organic chemist Dr. K.C. Nicolaou and structural biologist Dr. Yousif Shamoo and their colleagues created and tested a number of variants of viridicatumtoxin B that could lead to the simplified synthesis of a new generation of more effective antibiotics. 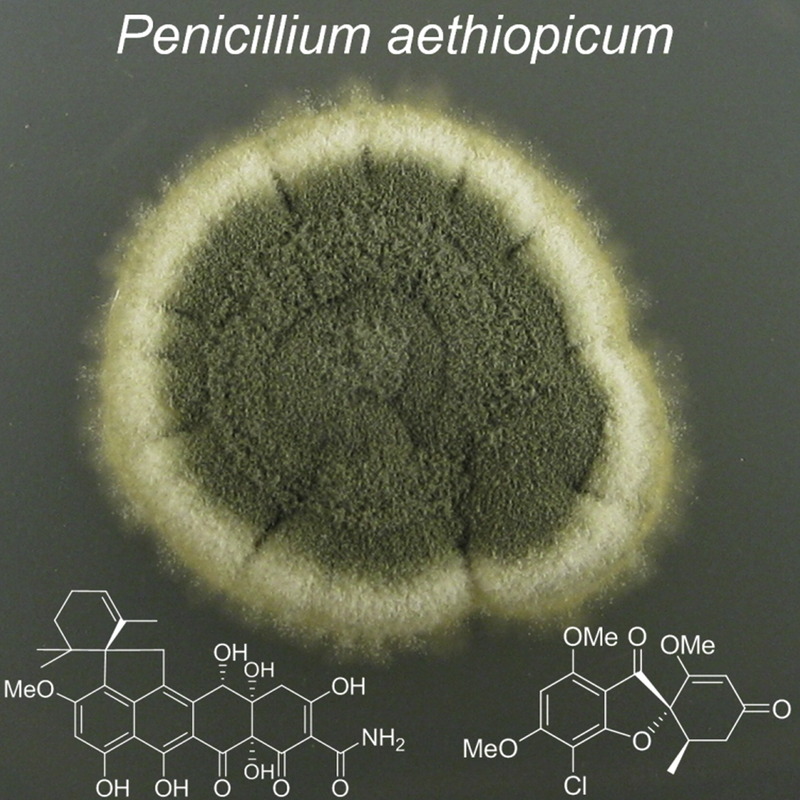 The work, reported online on August 15, 2014 in the Journal of the American Chemical Society (JACS), focused on a tetracycline discovered in 2008 by scientists who isolated small amounts from penicillium fungi. The yield wasn’t nearly enough for extensive testing, but it provided a basis for the discoverers to analyze its structure through magnetic resonance imaging, Dr. Nicolaou said. “We’re inspired by molecules that are biologically active and have the potential to become medicines one day,” he said. The new discovery belongs to a class of antibiotics known as tetracyclines for their distinctive molecular structure. They proved potent in initial tests on Gram-positive bacteria, so named for a staining technique to mark bacteria that are more susceptible to antibiotics than their Gram-negative counterparts. The first tetracyclines, discovered in the late 1940s, ushered in a new class of powerful antibacterial agents to treat high-mortality diseases, among them anthrax and plague, as well as such bacterial infections as chlamydia, syphilis, and Lyme disease.